Bring your work into your Neutral Reach Zone, starting with the keys and design your ideal workstation with the Humanscale 300 Curved Keyboard Tray. 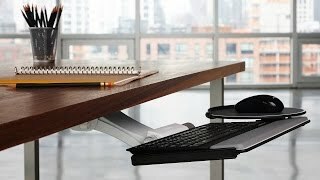 Its unique, curved design lets users of natural or wave ergonomic keyboards increase their comfort even more with the addition of a single, work-transforming tray. Design your own keyboard tray for an optimally functional workstation that supports you and leads you to better work with help from the Humanscale 300 Curved Keyboard Tray. The Humanscale 300 Curved Keyboard Tray is only available in Black. This is the older version of the 5G mechanism, featuring dial-a-tilt keyboard angle adjustability. This is a version of the 4G with a longer arm for use above a work surface, making it great for sit-to-stand solutions. A curved palm support is not available for the Humanscale 300 Curved Keyboard Tray. A second mouse pad can be ordered with the Humanscale 300 tray for configurations utilizing two mouse platforms.